Hallux valgus (also commonly termed a “bunion”) is a deformity at the first metatarsophalangeal joint (MTPJ). It is characterised by medial deviation of the first metatarsal and lateral deviation +/- rotation of the hallux, with associated joint subluxation. This condition is one of the most common foot problems in the adult population, with a prevalence of around 35% in those aged >65yrs and more common in women. In this article, we shall look at the pathophysiology, clinical features and management of hallux valgus. During the gait cycle, the digits should remain parallel to the long axis of the foot. This is made possible by a balance between static stabilisers (bones and ligaments) and dynamic stabilisers (muscles and tendons). Due to the gross anatomy of the foot, the first metatarsal remains inherently unstable, heavily relying on these stabilising structures. There is therefore a greater risk of disturbing the fine balance. Once the metatarsal head escapes the intrinsic anatomical control, the extrinsic tendons become a deforming force, causing the first metatarsal head to drift medially. This medial joint tension causes the bone to proliferate on the dorsomedial aspect of the head of the first metatarsal and the cartilage is affected by the subsequent remodelling. Anatomical variants, genetic predisposition, and environmental factors can all further contribute. In predisposed individuals, wearing high-heeled or narrow-fitting footwear can aggravate the condition by keeping the hallux in a valgus position. On examination, assess position and lateral deviation of the hallux (Fig. 2) and check for evidence of inflammation or skin breakdown over the prominence at the base of the hallux. Check for worsening of the prominence in the weight-bearing position. Ensure the foot is assessed in both a non-weightbearing position and weightbearing position. Contracture of the extensor hallucis longus tendon may be visible in longstanding joint subluxation and any excessive keratosis on the foot may indicate signs of abnormal weight distribution from an altered gait. The main investigation is radiographic imaging (Fig. 3), used to assess hallux valgux; it is often useful for the degree of lateral deviation and signs of joint subluxation. All patients should be prescribed sufficient analgesia, limiting the effects of the condition on quality of life. Advise on adjusting footwear to prevent the deformity from worsening and preventing irritation of the skin over the medial eminence. If the patient has flat feet, then an orthosis may help to prevent the progression of the condition. Physiotherapy can provide stretching exercises and gait re-education as indicated. Chevron procedure – a ‘V shaped’ osteotomy of the distal first metatarsal is created, allowing the first metatarsal to be shifted laterally back into a normal alignment, then fixed by pins and screws. Scarf procedure – a longitudinal osteotomy is made within the shaft of the first metatarsal, for the distal portion to be moved laterally and fixed with two screws. Lapidus procedure – the base of the first metatarsal and medial cuneiform are fused. Keller procedure – an incision is made over the first MTPJ and the joint capsule is opened to expose the joint, with the diseased joint surfaces removed for a space to be left that is stabilised by suturing of surrounding tissues and subsequent scar tissue. Surgical complications for all the aforementioned procedures include wound infection, delayed healing, nerve injury, and osteomyelitis. Recurrence is not uncommon. 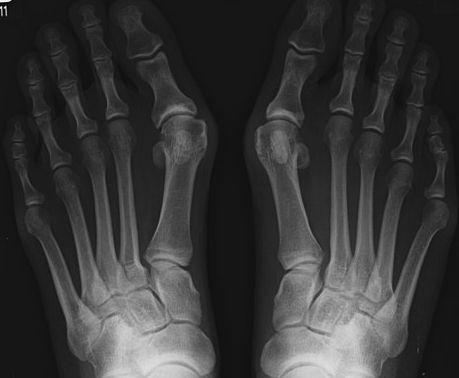 Complications of hallux valgus include avascular necrosis, non-union, displacement and reduced ROM. Prognosis is variable in this condition as the deformity may remain stable or progress rapidly. Conservative management can help to alleviate symptoms but will never correct the deformity.